The concept can help health care organizations adapt more smoothly to a new payment environment. In the health care industry, nothing stays the same for very long. This is particularly true as health care reform evolves and ongoing changes in care delivery take shape. Industry experts report that the transition from fee-for-service to value-based care is one of the year's most pressing issues, with health care organizations moving quickly to ensure they're prepared. At the heart of an organization's readiness is its ability to make care decisions based on trustworthy data. While the evolution of value-based care seems to be top of mind recently, it is important to note that value-based care programs have been in place in various models for several years. Focus areas have included hospital value-based purchasing, hospital readmission reduction, physician value-based modifier, and hospital-acquired conditions. Additional efforts, such as alternative payment models and the merit-based incentive program, both part of the Medicare Access and CHIP Reauthorization Act of 2015, are set to be implemented in 2019, with providers reporting data this year. These programs focus on quality of care and reduced costs, shifting the focus from "how many" to "how good is it" and "what is the cost associated with the care provided." It sounds simple: We need to provide quality care at the lowest possible cost. However, behind the scenes are varying industry drivers and initiatives that affect an organization's ability to successfully make the transition to an environment of high-quality, efficient care. At the heart of these are technology and interoperability initiatives. The constant growth of technologies, including mobile devices, and the resulting increase in data and information, present their own set of challenges. In addition to dealing with the gains in data and information volumes, health care organizations are being driven to exchange information to ensure transparency and the availability of patient information across the continuum of care, goals reiterated in the 21st Century Cures Act. However, organizations often lack the tools to successfully manage and exchange information. How does a health care facility balance technology (and the resulting data) with the need to exchange quality information to ensure success in a value-based environment? Additionally, health care organizations moved quickly to implement certified EHR solutions in order to take advantage of the incentives included in the HITECH Act. New technologies emerge every day, providing more cutting-edge mobile access to patient care. While these technologies are necessary to ensure quality care can be delivered in the most cost-effective accessible manner, they come with their own set of challenges. The ability to make sound technology decisions that focus on the use of information is critical. It's not only about the technology itself but also how the technology will capture, generate, and report all types of information for patient care. Implementing these technologies with the right stakeholders making decisions about data sets, work flows, and usability is necessary to ensure not only a successful implementation but also long-term sustainability. This applies whether the technology is a large EHR or a less-imposing solution. Each day all technologies generate volumes of data, most of which are unstructured. This leaves health care organizations pondering how to best manage technology decisions and how to convert data into reliable pieces of information that can improve patient care. Essentially, interoperability allows providers to share patient information to promote quality cost-effective care and reduce rework and redundancies. However, interoperability presents a number of challenges. In addition to the hurdles inherent in the technology's ability to share data, there are many differences in how information is defined and collected across health care organizations. Even within a given organization, decisions about data are often made in silos or individual business units, resulting in internal interoperability challenges. How are health care organizations working alongside technology partners to ensure interoperability is achieved? 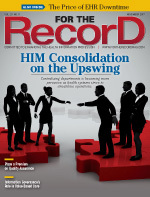 How are health care organizations working internally to address data standardization? Many hospital initiatives address the creation and use of patient data and examine technologies that run behind the scenes. Various business units are tasked with managing their processes and information. Unfortunately, there is not always a collaborative effort across these units to ensure that information guidelines fall under the same policies, definitions, and auditing processes. This results in inconsistencies, risk, and bad business decisions. There needs to be a formalized plan that provides a single line of oversight for the entire organization. AHIMA believes that a formalized organizationwide information governance (IG) program is the answer to the interoperability and technology issues posed by today's evolving health care environment. A constructive IG initiative meets the needs of value-based programs that demand accurate and timely information be readily available and well protected. AHIMA works to raise awareness around the importance of an IG program and how it can gain hospitals a competitive advantage. AHIMA describes IG as "an organizationwide framework for managing information throughout its life cycle and supporting the organization's strategy, operations, regulatory, legal, risk, and environmental requirements." • An organizationwide framework: IG is a formalized program with a defined infrastructure, reporting to senior leadership as well as the organization's governing body. • Lifecycle: Addresses every aspect of information, from its creation and use to reporting and disposition. • Strategy: An important concept of IG is to ensure that the program's goals support the organization's strategy, mission, and values. • Regulatory, legal, risk, and environmental requirements: Currently, IG is not mandatory nor required by any regulatory or accreditation agency. However, IG's objective is to support regulatory, legal, and other requirements that require trustworthy information. Therefore, an argument can be made that IG is required to support health care requirements and obligations. Many health care professionals are familiar with traditional HIM, which focuses on the oversight and management of clinical information. IG takes this concept and expands it across all information throughout the entire organization. This includes data pertaining to clinical, financial, human resources, vendor contracts, purchasing, and supplies. IG is more than a trendy concept; it's a commitment every health care organization should undertake. Think of information as water flowing through the pipes of a community. In health care's ecosystem, data flow continuously. And, like water, they're shared and used by all. Therefore, all users must be information custodians, keeping them clean and consumable. To better understand IG, it's important to know its origins. In 2009, ARMA International released the Generally Accepted Recordkeeping Principles, which gave definitions to IG concepts. The eight principles can be applied to all industries. • Accountability. Health care organizations should designate a member of senior leadership as accountable for its information. A supporting committee or council should be formed with key stakeholders to ensure that governance activities are agreed upon and driven down through the organization. Ultimately, the governing body should oversee all activities around information creation, use, and disposition. • Transparency. Health care organizations should document all information processes and activities. These documented processes should be verifiable and available to the workforce and others who need them. • Integrity. Health care organizations must ensure that information is reliable and authentic. This applies to internally created information as well as data received from outside sources. • Protection. A solid IG program must ensure protection from the breach, loss, and theft of clinical information, private information, and the health care organization's intellectual property. • Compliance. Health care organizations are obligated to ensure that all legal and regulatory requirements, as well as organizational policies, are met. • Availability. Health care organizations must ensure that information can be retrieved and made available for use in a timely, efficient, and accurate manner. • Retention. Health care organizations must ensure that information is retained for the required time specified by state and federal laws. Information should also be maintained for as long as it's needed for patient care and business purposes. • Disposition. Once it is determined that information has been maintained for the time required through statutory requirements and is no longer needed for business purposes, data should be disposed of in an appropriate manner. Disposition may include destruction; a change in ownership or management, as in the case of an acquisition or merger; or transfer to another permanent medium. Each of these principles is written to address the ongoing information challenges faced by health care organizations, particularly as they move to a value-based care model. The principles help to ensure that a formalized IG program addresses each area of information across the enterprise. AHIMA has developed an Information Governance Adoption Model containing 10 competency areas that focus on all aspects of the management and oversight of information decisions. Three key competencies focus on technology, data, and interoperability challenges: IT governance, data governance, and enterprise information management. • IT governance ensures that a health care organization's IT strategy is aligned with organizational goals and objectives. Additionally, IT governance applies the best demonstrated practices to technology decisions, ensuring stakeholder input; risk mitigation; and technology performance measurement. • Data governance provides for data standardization, data quality controls, and monitoring of data-related processes and outcomes. • Enterprise information management addresses the lifecycle of information from its creation or capture to its use and reporting, sharing, and storage and disposition. These competencies must be aligned and work collaboratively in the execution of practices essential to data and information management. Each of these competencies includes specific requirements to address how technology decisions are made, how master data and metadata are defined and managed, and how data and information are used for high-quality, cost-effective patient care. There's never been a better time to start an IG program or to further mature a current endeavor. Health care organizations have an ethical obligation to ensure that all decisions regarding data and information are trustworthy. • Learn about IG in health care. Consider in-person and virtual training options and network with peers through professional organizations. Magazine and journal articles provide additional information. • Educate senior leadership on IG and what it can mean to the organization. • Gain the support of peers who have similar concerns about current processes concerning data and information. • Download available tools and resources and share them with key stakeholders. • Discuss IG in terms of organizational strategic goals, in particular value-based care readiness. Organizations that have already implemented an IG program should consider assessing its maturity. The organization can then begin work to identify gaps, prioritize IG-related projects, and celebrate IG successes. A formal IG program positions health care organizations for success in a value-based care environment. By making IG a priority and ensuring that information is accurate, available, timely, and user-friendly, technology decisions are more likely to support the best interests of patients, providers, and exchange partners. — Ann Meehan, RHIA, has more than 30 years experience in health care leadership and consulting. She has spent the last 25 years in Nashville working for organizations such as HCA, Vanderbilt Medical Group, St. Thomas Health, Parallon Business Performance Group, and, most notably, Ardent Health Services, where she was vice president of HIM for 10 years. Meehan's currently the director of information governance at AHIMA.